A question was raised recently about the history of the Frisian "Staartclock" that has been on display at the Dekker Huis Museum since the summer of 2000. 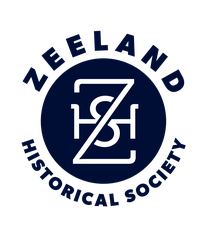 Using the search tool on this website, we typed in "Frisian" and found the original article that was written when the Staartclock was donated to the museum. 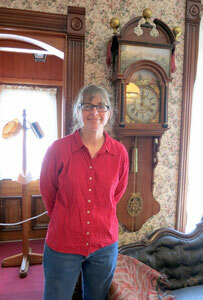 The clock was a gift from Mrs. Theresa Tolsma of Drenthe, who now lives in Jenison. Her son came into the museum last September [September 1999] and talked with Museum director, Mary Jane Vander Weide. 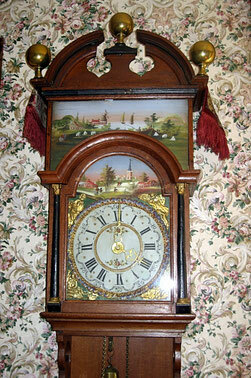 Later, he wrote the history of this clock: "It was in my mother's father's family since about the 1780's. 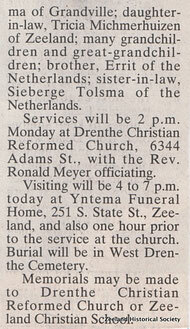 Her father, Hoeke Hiemstra, lived in Easterman, Friesland, Netherlands from 1866 to 1954. The clock stayed in my grandmother's house until she died in 1973 and my mother inherited it and had it shipped to Drenthe, Michigan." The name Staartclock came from the long case necessary for the long pendulum which looked like a tail, which in Dutch is Staart. The Staartclock became the best-known Frisian clock, and its production really flourished in Friesland and surrounding areas between 1825 and 1875. There are years in which more than 4000 handmade clocks left the workshops! In 2015, Dawn Uitvlugt visited the museum and informed us that her grandmother, Theresa Tolsma, donated this Frisian Staartclock in 2000. 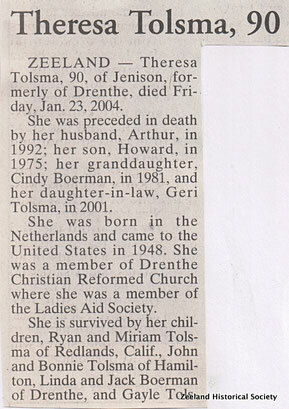 Using the search tool on this website, we typed in "Tolsma" and found this obituary located in our collection of "Death Records T U".